Margo Goldfarb '20 worked with Professor Kerry Rouhier on crucial enzyme research. More about Goldfarb and Rouhier's project. A chemistry class taught by President Sean Decatur sheds light on the wonder of bioluminescence. Read more about the seminar. Kenyon President Sean Decatur addressed Stanford University chemistry graduates and shared lessons on science in the liberal arts. Read excerpts from President Decatur's speech. From doughnuts to e-cigarettes, Kenyon chemistry students use science to educate middle schoolers on addiction. Read more about the collaboration. Kenyon will receive a $1 million grant to engage underrepresented students in the natural sciences. Read more about Elizabeth Boon. From food chemistry to an innovative organic chemistry lab, students shared their work at the first annual Kenyon Showcase. Kenyon's chemistry faculty takes on the complexity of solar-energy research. Read more about solar research at Kenyon. Chemistry often is called “the central science” because all investigations of matter at the molecular level depend on the theories and methodologies of chemistry. Making its home in Tomsich Hall, part of Kenyon’s top-flight science quad, the Department of Chemistry contributes to interdisciplinary programs in biochemistry, molecular biology, neuroscience, and environmental studies. 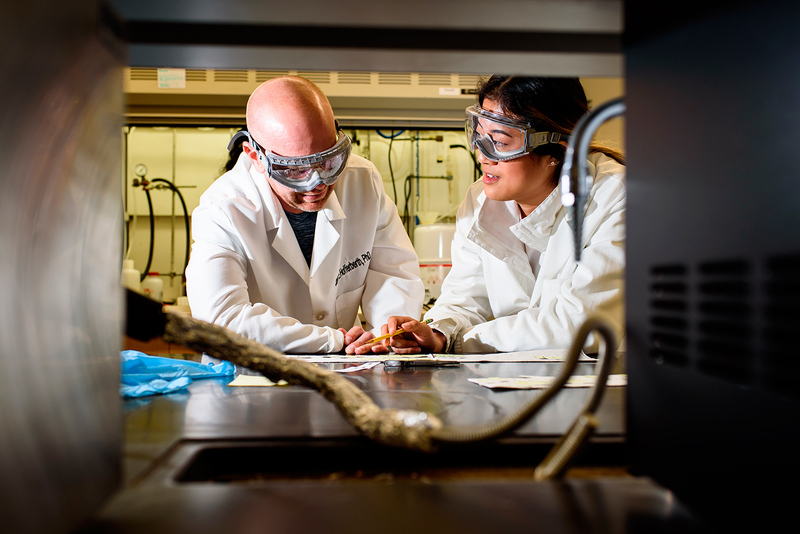 Chemistry students have the extraordinary opportunity to join with faculty members in laboratory research. This degree of access is rare at the undergraduate level and essential to graduate work and success in the job market. Students also may compete for grants to spend the summer in Gambier as Summer Science Scholars. If you have an AP Chem score of 4 or 5, you may enroll directly into Chem 122 (Chemical Principles). Alternatively, you may qualify for Chem 122 by taking the online placement exam any time after August 7. The placement exam is the first assignment of both introductory courses (Chem 121 and Chem 122) and may be completed prior to Orientation. Associate Professor of Chemistry Sheryl Hemkin replaces Jan Thomas as associate provost, as Thomas steps in to lead Kenyon’s Office for Community Partnerships. Kenyon’s president addresses Stanford University chemistry graduates and shares lessons on science in the liberal arts. Two Kenyon students win Goldwater Scholarships, the most prestigious undergraduate award in STEM fields. A chemistry course taught by President Sean Decatur sheds light on the wonder of bioluminescence.